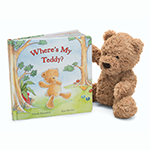 'Where's My Teddy' book along with Bumbly Bear plushie is a fantastic set to give as a gift to any infant, child or anyone young at heart. Where, oh where, is that bear? Where's My Teddy?' is just the tale for tots who love their bear to bits. Gorgeously drawn and sweetly told, it's a story about friendship and teddy loyalty. A beautiful hardback full of rhymes and fun, with a message for everyone: Always take care of your very best friend. Included in this set is Bumbly Bear. A ruffly, fluffy fellow with an extra-long snout for vintage style, he's a classic bear with a modern twist. His large head and tummy and chunky feet make him just the chap for bedtime hugs. With those tufty ears and that chocolate-drop nose, he's a bear necessity! A sandy, dandy teddy, Bumbly Bear is simply scrummy.